Emulab allows the ability to setup a control-network firewall between an experiment and the outside world. This is not a firewall between nodes within an experiment, that is, the firewall is not part of your NS-specified network topology. The purpose of an Emulab firewall is to prevent experimental traffic from escaping, via the control network, to the Internet due to a mis-configured application or router within an experiment. Control net firewalls are also a key component of Emulab high-security experiment environments. The firewall is implemented by allocating an additional node to the experiment. Through switch-enforced VLANs, the experiment is given its own private control network connecting all nodes in the experiment. Network traffic between experiment nodes and any hosts outside the experiment (Emulab infrastructure or Internet hosts in general) must pass through the firewall node. The firewall is setup as a filtering layer2 bridge using IPFW2 on FreeBSD and can be configured in a number of ways to block or allow certain types of traffic. When a firewalled experiment is swapped in, the firewall is setup and activated before any experiment nodes are allowed to setup. Currently this adds approximately five more minutes to swapin time, as the firewall node must first be loaded with the FBSD-IPFW2 disk image. When a firewalled experiment is swapped out, extra precautions are taken to ensure that the nodes are decontaminated before the firewall is taken down. The nodes, including the firewall itself, are scheduled to boot into a network-loaded, memory-based version of FreeBSD (the "MFS") which will run a script to zero all the known bootblocks on the disk. This prevents a node from accidentally booting from its disk prior to being reloaded. The "boot to MFS" process is done not by issuing a reboot command or even by doing a power cycle, but rather by simultaneously powering off all nodes and then later powering them back on. Reboot is not used since the reboot command could be spoofed on a contaminated node. Power cycling is not used since cycling is normally performed in batches to avoid network (or power) overload on restart. Skewed reboots like this open a window of vulnerability where nodes rebooted later might be able, before they are rebooted, to spoof the reload server for nodes that have just rebooted. So we first turn everyone off so that later batched power-ons are safe. Only when all nodes are known to be running in the MFS and their disks neutered, will the nodes be released to the reloading experiment. Any failure in the above process results in all nodes for the experiment being left powered off, with the control net disabled, and marked as "paniced" so that only a testbed admin can swap it out. open: A completely open firewall allowing all traffic. This gives you a hook for setting up custom firewall rules (below). closed: A closed firewall allowing no communication with the outside world or other experiments within Emulab. Nodes can still communicate in a limited fashion with the Emulab infrastructure. basic: A mostly closed firewall allowing only ssh connections from the outside world, and HTTP/HTTPS connections from inside (primarily for Windows Update on Windows XP nodes). For an iptables-based firewall, rules for packets coming from outside the firewall are handled by a chain called OUTSIDE, while packets coming from inside the firewall are handled by a chain called INSIDE. Packets going to or coming from the firewall itself are handled by the INPUT and OUTPUT chains respectively. allowing more precise control over their interpretation and allowing for linked rules. A complete example is shown below. It should be noted that user-specified rules will only apply to IP traffic passing through the firewall. Non-IP traffic is not allowed through the firewall, and traffic to the firewall node itself is controlled by a different set of rules which cannot be overridden with this mechanism. For example, in a closed firewall that does not allow ssh, you can add a rule to allow ssh access from a particular machine to one of the firewalled nodes, but not to allow access to the firewall itself. One should note carefully the following issues. The firewall is just another node in the topology. It is setup just like all other nodes, this includes enabling accounts and NFS access. Thus anyone who can login to a node, can login to the firewall. This is not as bad as it may sound since the firewall node is subject to its own rules. Thus, in all but the open firewall style, the firewall node rejects all packets sent to it from the inside, and in the closed firewall, it rejects all traffic from the outside as well. However, even with the firewall rules, the nodes and the firewall do share common filesystems in /users and /proj. In the future, firewalls will have much more constrained access. The firewall must run FreeBSD with IPFW or Linux using iptables. However, this is not fundamental to the design and we hope that the firewall syntax will be general enough to support other implementations. The firewall rule syntax is fixed. In particular, it allows only fixed strings with no form of per-user or per-experiment variable substitution. There is a limited form of substitution used to plug in Emulab-wide parameters such as the Utah control network subnet. Since IPFW allows hostnames, you can at least use symbolic host names (i.e., the node names you use in your NS file) in place of IP addresses in your rules. Firewall setup is static. Rules are specified in the NS file at experiment creation time. Rules can be changed using experiment modify, or by logging into the firewall and changing rules by hand with IPFW or iptables. A more dynamic interface may be desirable, in particular integration with the event system. On the other hand, it is not necessarily a good thing to have a firewall that is too easy to (mis)configure. There is always a firewall for experiments. Keep in mind that Emulab has an external firewall already which imposes some site-wide restrictions (yes, there should be a link here...) So just allowing some ports through your experimental firewall doesn't guarantee that the affected traffic will make it to the outside world. The firewall exposes more of the infrastructure than it should. The Emulab node self-configuration and monitoring infrastructure uses a lot of different services on the boss and ops nodes. At the current time, we allow all those through. Moreover, many of these, such as TFTP, cannot be pinned down too precisely in firewall rules, so the rules are more open than we would prefer. Additionally, we also currently preserve the shared filesystem access model inside firewalled experiments, which permits not only attacks on NFS but allows for trojans to be placed in the filesystems. For particularly anti-social applications, you should check out Emulab in Emulab. $fw add-rule "allow udp from EMULAB_CNET to any 33434-33524"
$fw add-rule "allow udp from any 33434-33524 to EMULAB_CNET"
$fw add-rule "allow tcp from users.emulab.net to n1 setup keep-state"
$fw add-rule "iptables -A OUTSIDE -p udp -s EMULAB_CNET --dport 33434:33524 -j ACCEPT"
$fw add-rule "iptables -A INSIDE -p udp --sport 33434:33524 -d EMULAB_CNET -j ACCEPT"
$fw add-rule "iptables -A OUTSIDE -p tcp -s users.emulab.net -d n1 -y -m conntrack --ctstate NEW -j ACCEPT"
EMULAB_CNET is an example of the limited variable replacement capability. In the Utah case, it expands to "155.98.36/22". Note that even though this rule names the entire control net space of all experiments, it effects only those nodes within this experiment since the firewall is per-experiment. The last add-rule invocation demonstrates using a symbolic node name, "n1", to reference the node identified by the object "$n1" in the NS file. This rule also takes advantage of the dynamic rule capability in IPFW2. The rule itself only allows through TCP packets in the "setup" state (SYN but no ACK), but instructs IPFW to construct a limited lifetime dynamic rule allowing bidirectional traffic between the source and destination IP addresses and TCP ports from the packet. The rules from 10 to 79 are for the firewall itself, from 80 to 65534 are for bridged ("layer2") packets, i.e., those that pass through the firewall. As user rules start at 100, Again, notice the rules with EMULAB_ variables. NS is the Emulab name server IP address, CNET the control network subnet, MCADDR and MCPORT, the multicast addresses and ports used by the Frisbee disk loader. Other rules involving the hosts boss, ops, fs, ntp1, and ntp2, are Emulab infrastructure related. The firewall was implemented using OS-provided routing. Specifically, every node has its default route changed to point to the firewall node. Sufficiently powerful applications could accidentally or intentionally change the default route back to the Emulab router, thus circumventing all protection. Intra-Emulab traffic was not firewalled. 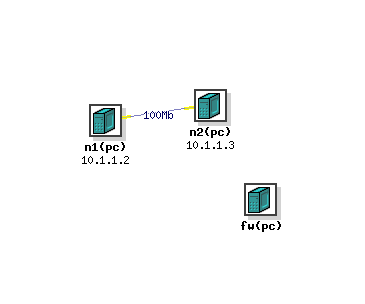 Traffic between nodes over the control net (155.98.36.x addresses) is not filtered since the shared control net is a LAN and all other nodes are directly reachable. Additionally, traffic between the nodes and the Emulab infrastructure (boss and ops) does not pass through the firewall. Host routes are explicitly setup to avoid the firewall.